The basis of this forum is: bikes being built or converted, and the following of those projects from beginning to end. What is meant by this is that just buying a bike whole isn't reason enough to start a thread in here, but if you've been involved in the design, the accumulation of parts and have made something that you're proud of (physically yourself or by through conception and building) then feel free to start a thread and show us what you did. You can start a thread to act as an historical document of a build, just don't start a thread for an OTP or buying someone else's fully-built bike. Oh, and 1 thread per bike so that they can be found easier later. If you just have small tweaks or randomness, feel free to continue to use the big CP thread which I've stickied. Maybe some guidance about thread titles? I can already see a "My first bike build" thread. Should people be more specific in their titles? I try not to dictate... useful titles will emerge and people will ask for older ones to be changed. I've always enjoyed all "current projects" in one thread. Very easy to browse through and to spot when eyes are caught by an interesting picture or phrase. Now you have to open many different threads, something you (I) will not do. On the other hand, searching may become a bit easier. You could always search within a thread. Please make sure to actually post photos iso links to your flickr or whatever. ^^ That sounds about right. It would be crap to have to trawl through hundreds of "New bar tape!" threads just to find anything of interest. Current projects has always been a favourite of mine - is it possible to get it put on the link bar (whatever it's called) at the top? I'm trying to build a bike for my gf, its just at the discussion stage at the moment, looking at frames and how she wants to be positioned and the inevitable colour over practicality issues... is it too early to start my very on CP thread? Not if you know you're going to build it... yes it's too early if it's still a maybe. Well she's just volunteered to take some slaggy photos when its built so if thats not an incentive I don't know what is. Now I just have to find a 60cm track frame. You have a tall girlfriend. Yeah, 6'2, hence the comedy frame as my start point. So I've been working on a side project that is about bikes, but not a bike. It's a web app type thing that could potentially be a great resource. Would people be adverse to me starting a thread in here or is there a better place? My post in current projects automatically went on locked for replies. How do I unlock it? How do we edit the title of a post? 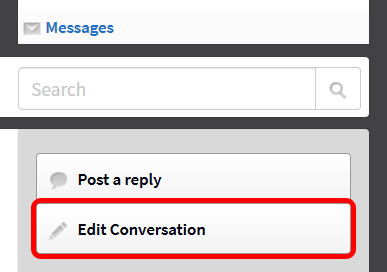 'Edit Conversation' in the top right hand corner.